www.syazaraihanah.com is a personal blog. All content provided on this blog is for informational purposes only. 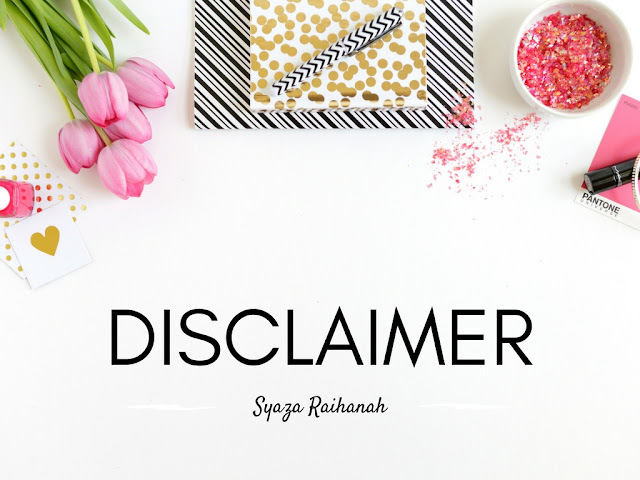 I, Syaza Raihanah as the author and owner of this blog makes no representations as to the accuracy or completeness of any information on this site or found by following any links on this site. The owner, Syaza Raihanah will not be liable for any errors or omissions in this information nor the availability of this information. I, Syaza Raihanah will not be liable for any losses, injuries or damages from the display or use of this information. These terms and conditions of use are subject to change at any time and without any notice. Unless stated, all the pictures in this blog belong to the owner of this blog and stock photos from a few sites. You are prohibited to copy, download or share any pictures on this blog without the owner's permission. Comments are welcome. However, please note that improper and insulting comments will be deleted. Any personal remarks and attacks may be deleted. Any comment that content of link spam or marketing messages will also be deleted. I, Syaza Raihanah will not responsible for the content in the comments other than those made by me, or in blogs or any other online content that I may link to.